Groups file signatures to recall Wis. gov. Groups seeking to recall Republican Gov. Scott Walker submitted nearly twice as many signatures Tuesday as required to force an election, an overwhelming number that may make a vote later this year inevitable. 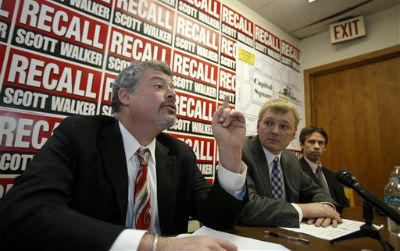 MADISON, Wis. (AP) — Groups seeking to recall Republican Gov. Scott Walker submitted nearly twice as many signatures Tuesday as required to force an election, an overwhelming number that may make a vote later this year inevitable.